Seeing and hearing are the best ways to learn about our people, mission, activities, and our confession of the historic Christian faith. Whether you have grown up Lutheran, in another denomination, or are learning about the faith, we encourage you to be part of the conversation regarding sin, forgiveness, meaning in life, having peace, and the promise of everlasting life. Sunday worshipers dress up a bit more, but anything considered business casual is appropriate. Things are a bit more casual on Saturday evenings as worshipers arrive after the day's events or before evening activities. We conveniently print the entire service in a worship folder, which helps guests and younger members follow along easily. We retain a structure of worship that dates back to the first century, which includes an invocation prayer, confession of sins & announcement of forgiveness, Scripture readings, and liturgical choruses that direct our faith to Jesus Christ. We select our order of worship from the Lutheran Service Book, and rotate regularly between Divine Services One, Three, and Four. We occasionally use Divine Service Five, the Service of Prayer and Preaching, Matins, Vespers, Evening Prayer and specially-written liturgies. We sing traditional hymnody accompanied by organ or piano, drawn from rich Christian traditions throughout the world, including American, English, European, African, Asian and Hispanic influences. Occasionally we enjoy the music provided by our hand bell choir, adult choir, children's choir, or soloists. Jesus said, "Let the little children come to me," so we prepare worship services to be meaningful for all ages. Families are encouraged to worship together at St. Matthew and teach worship skills as soon as children are able. We include a Children's Message in each of our services, where little ones (and sometimes parents) sit near the pastor in the chancel and hear about the day's Bible teaching. Busy bags may be picked up outside the sanctuary, filled with board books and Christian coloring pages for little ones. Our ushers hand out Children's Bulletins for children a little older. There is a small, unattended Nursery at the back of the sanctuary where a parent can take a baby to quiet down during a crying spell, then return to worship. Some families use the Narthex for the same reason, where restrooms with changing stations are located. Children are a gift of God who pray and sing praises with us! We also have Sunday school for all ages at 9:30 a.m. Children are lovingly taught from the Bible with age-appropriate lessons. The focus is always how much God loves and cares for us through the life, work, miracles and promises of Jesus. By partaking of the Sacrament of Holy Communion, we give public confession to our unity in the Christian faith. 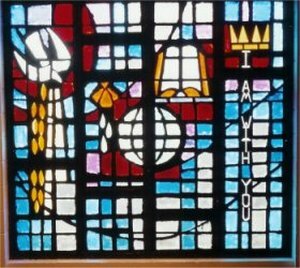 We invite members of St. Matthew or other LCMS congregations to commune. If visiting from another Missouri Synod congregation, please introduce yourself to our pastor. If you are not part of the Lutheran Church, know that we do not exclude people from communion; rather, we invite those who wish to commune to take steps to learn about the Christian faith as it has been passed down to this generation. Typically those who wish to commune attend Adult Information Class with the pastor, or visit with the pastor to be accepted by Affirmation of Faith. Most church bodies throughout the world practice closed communion--that is, only members of their church body may commune together--because those who commune hold the common recognition that we sinners have a Redeemer in the person of Jesus Christ, true God and true man, who gives His very body and blood to us in, with, and under the bread and wine. We offer the common cup and individual cups at every service. A pastor or elder will first bring bread, followed by individual cups, then common cup. The common and individual cups hold regular wine. The center ring in each tray contains cups of water with a single drop of wine, for those who desire Holy Communion but abstain from full-strength wine for reasons of health or conscience. Gluten-free wafers are also available in the center of the bread tray. Speak to a pastor about membership. Check out adult Bible class on Sunday morning. Explore the service and fellowship groups to see where you might grow spiritually.